Two posts from me this morning, at midday our new website goes live so shall be back with some peaks and will post a link. We have gone through a bit of a re-branding exercise and have dropped the word Atelier so from next week when you click on the old site it will be re-directed to the new site,Â this week it won’t.Â Since you guys are like my best buddies and IÂ canât wait until next week when everything is official, you can view it live from midday. Its caused a few heated discussions in team Ahern, certain people thinking I should wait until everything is linked together, but hell with that, who can wait till next week, its like years away. Plus I love the new site and I want to show you guys, DOUBLE PLUS I’m the boss, so there, discussion over right? Down to business. I talk about colour a lot, it seems particularly apt at the moment with the last few days being sunny and dare I say a tad warm. Spring is around the corner; things in the garden are starting to bud and the birds (even at this hour are singing full throttle). Love it! Now if we were following convention (thank God we are not) I would be yabbering on about pastel hues, as soon as spring arrives out they come from the dreary back cupboard. Put me near a pastel and I swear I have an allergic reaction, itchy, twitchy, followed by a strong bout of depression, cannot stand them. Put me near some electrifying oddball type hue like yellow, burnt orange, red and suddenly I’m skipping and singing like the birds. Colour is the most transformative thing you can do to any room, and its effect on each and every one of us is personal. I like yellow, you might like pale blue and that’s all fine, except we must never ever meet it would be a disaster! From experience the more namby pamby you are with you colour choices, (i.e. wishy washy pastel type hues) the more namby pamby your scheme. With all my years in the business, itâs the most tantalising interiors that stand out. I’m going to compare it to food,Â Heston Blumenthal’s food stands out and he pushes convention, dares to be different and takes you on a journey you never thought possible. I had the enormous pleasure of working on one ofÂ Hestonâs programmes last year and he blew me away. Passionate, energised and totally at the forefront of his game – and that comes across with his food. It raises your spirits, makes you happy and not only that you start to look at life slightly differently. To deep? Stay with me a second. My point, you’ve got to push it when it comes to design, not to be gimmicky or on trend but in order to take your scheme to a whole otherÂ level. Pastels, well may I suggest you ditch them, go oddball, be daring even if its the smallest thing in a offbeat hue, and watch just how transformative it is. Once you’ve crossed over there is no, repeat no going back! See what I am talking about, by going slightly off radar with colour. Also you don’t have to have a dark interior like me to make it work, check out Jenna Lyon’s office at J C Crew. 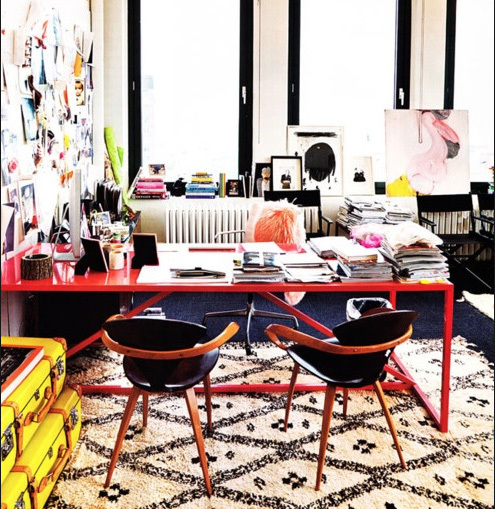 The red desk elevates the office, not to mention the splash of yellow in the corner. Even a vase, a throw, the odd painting, you don’t necessarily need to go down a furniture route, will elevate, up lift, pack a visual punch!